Here’s what’s happening in the world of television for Sunday, March 31. All times are Eastern. 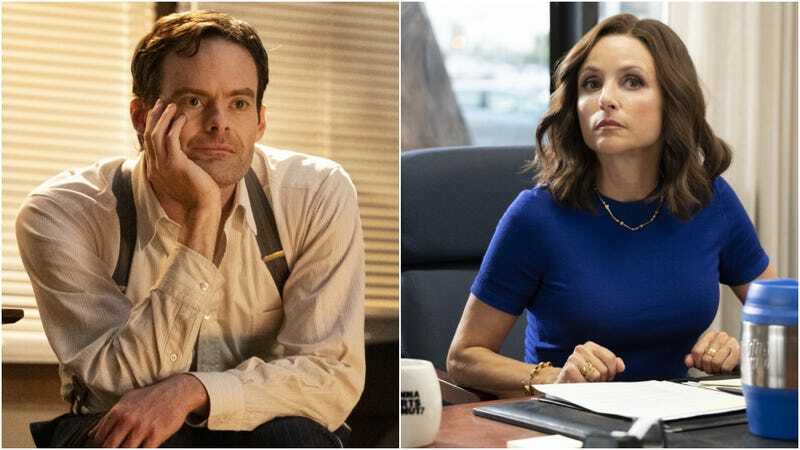 Barry (HBO, 10 p.m., second season premiere) / Veep (HBO, 10:30 p.m., final season premiere): Are you familiar with Shea Serrano’s disrespectful dunk index? It’s basketball-centric, obviously, but just stay with us here. The DDI is Serrano’s means of analyzing the disrespectfulness of dunks based off of things like degree of difficulty, post-dunk celebration, overall narrative, the response of the other players, and so on. Putting Barry and Veep back to back, beginning on this particular Sunday, is intensely, deliciously disrespectful. An arguable all-timer of a comedy, returning for its final season, airing directly after one of the best new series of 2018, each centering on a performance from one of the greatest living comic actors? Who, by the way, contain multitudes, to the extent that Bill Hader’s performance in particular is a melancholic masterpiece, while Julia Louis-Dreyfus’ timing and curse-word proficiency are both unparalleled? And on top of all that, beginning April 14, their lead-in series will be a tiny cult hit about Dragons and White Walkers and Drinking and Knowing Things? That’s extremely disrespectful. The Walking who? Never heard of it. Netflix? HBO doesn’t know her. Vikram Murthi (Barry) and Kate Kulzick (Veep) will recap the proceedings. Les Misérables (PBS, 10 p.m.): If your speed is less “hitman becomes actor” and “former President chases legacy and curses a lot in the best way possible,” and more “I stole a loaf of bread, I broke a windowpane,” Masterpiece’s adaptation of Victor Hugo’s sprawling novel begins tonight. No, there’s no singing (our kingdom for another, better cinematic take on “Stars”) but there is a hell of a cast, including David Oyelowo, Lily Collins, Dominic “McNulty” West, and recent Oscar winner Olivia Colman.